Shimla: Residents of hamlets spread across Himachal Pradesh's Lahaul Valley will have to wait four years more for completion of the much-delayed strategically important Rohtang tunnel near picturesque resort Manali, according to Chief Minister Virbhadra Singh. The chief minister gave the likely date for the project's completion in a written reply in the assembly on Tuesday. Relying to a question of BJP member Gobind Thakur, the chief minister quoting the chief engineer of the Rohtang tunnel project said 57 percent tunnel digging has been completed and the "construction is likely to be completed by January 2019". The construction work began in November 2011, he added. Every year, when heavy snowfall high up the Rohtang Pass closes the road connectivity to the valley in Lahaul-Spiti district for at least five months, the lone state-run helicopter, which normally operates once in a week to transport the locals, is the only mode of transportation. The construction of Rohtang tunnel, beneath the majestic Rohtang Pass, which is a major attraction for both domestic and foreign tourists and located 52 km from Manali, would ensure all-weather connectivity to the valley. 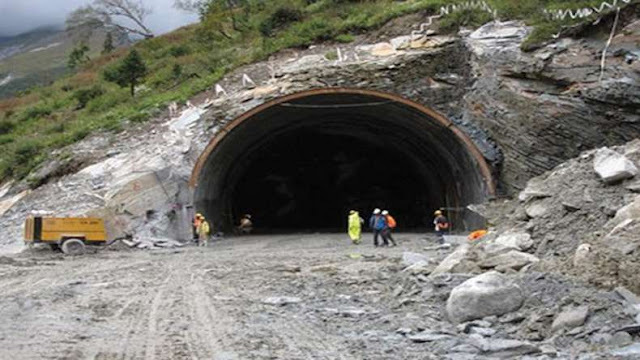 The Rs.1,495-crore tunnel's foundation stone was laid by United Progressive Alliance (UPA) chairperson Sonia Gandhi June 28, 2010, in the picturesque Solang Valley. Official sources told IANS that the horse-shoe-shaped 8.8-km-long tunnel has missed its February 2015 deadline and the delay will face a cost overrun of Rs.500-600 crore. The project is being built by the Border Roads Organisation (BRO) in collaboration with Strabag-Afcons, a joint venture between India's Afcons Infrastructure Ltd and Strabag SE of Austria.